Who’s standing up for animals this election? Australians won't only be choosing a government this election, they'll be helping to decide the future of one of Australia's cruellest industries. 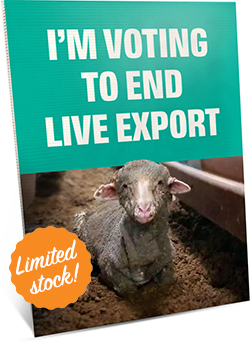 The 2019 Federal election will be defining for millions of sheep destined to suffer on live export ships, and in countries a world away from home. That's because 50 years after this trade began, major Australian political parties have made the fate of these animals an election issue. 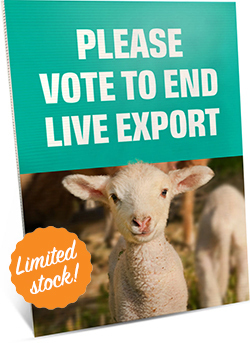 Do they support an end to live sheep export? Julia Banks MP - former member for Chisholm, now running for Flinders in Victoria. Click here to download this election guide. This election not only presents an historic opportunity to secure an end to the live sheep export trade but to show all politicians that animal welfare is a voting issue. Want to do more for animals? Share this with family and friends on Twitter or Facebook. Download and print this guide for your reference at the polling station. Bring this campaign to your neighbourhood! Right now, we have an historic opportunity to show politicians that animal welfare is a voting issue. Click here to order a campaign placard to display in your window or garden! 37 O'Connell Street, North Melbourne VIC 3051.